A video of Hong Kong actor Jacky Heung holding hands with actress Bea Hayden Kuo while in Taipei went viral today. Let that sink in for a bit. Holding. Hands. It's not surprising that netizens are putting the rumor mill into overdrive. Jacky Heung may not be the biggest celebrity yet but he's made a name for himself as an action star acting with the big leagues in movies like From Vegas To Macau III and League Of Gods. He is also the eldest son of film mogul Charles Heung and his wife Tiffany Chen. One of Bea's more recent dramas was The Starry Night, The Starry Sea in 2017 where she was briefly rumored to have dated Feng Shaofeng. It was immediately denied and felt more like a marketing gimmick. 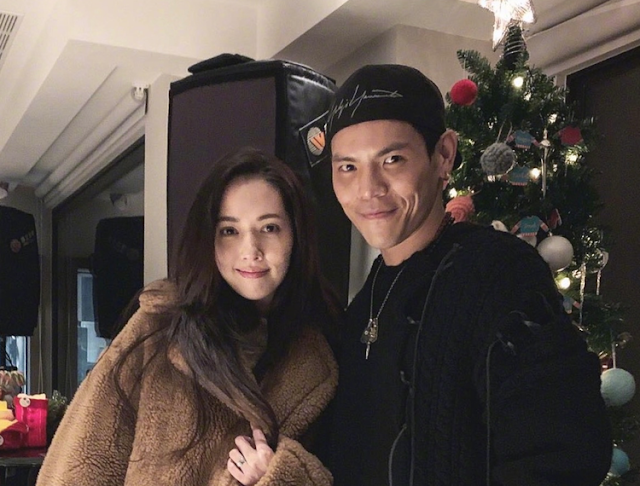 The actress known for being a beauty has a squeaky clean image and Jacky Heung's mother seem completely doting on the idea of Bea Hayden Kuo dating her son. Mother and son along with Bea and her father were all together in the variety show The Most Beautiful Times 最美的时光. Back then, Jacky was rumored to be dating someone else when his mother vehemently refuted the rumors. She said approvingly that everyone on her weibo are commenting that Bea is a better match. Bea's father jokingly said that they'd have to buy a house to fit all his daughter's pets (should Jacky and Bea get together). When asked for his comments about the video, Jacky Heung said what they see is what it is and that he won't say more. It looks like it's true!